"A particular set of skills" - A whole new genre of movie seems to have been created when Liam Neason uttered those words on screen in 2008. Does that seemingly harmless person you pass on the street secretly possess the ability to turn into a precise killing machine when confronting the bad guys that also walk among us? Now it is Jackie Chan's turn to join this list of movies that range from the really well done to the "how did this get made?". Quan Ngoc Minh (Chan) works hard, owns a restaurant in London, and does his best to provide for his daughter Fan. An everyday errand to pick up a dress sees her killed alongside a dozen others when a terrorist bomb explodes nearby, and a devastated Quan turns quietly towards a path of vengeance. A previously unknown faction of the IRA claims responsibility which draws the attention of Deputy Minister Liam Hennessy (Pierce Brosnan) who was an IRA member in his youth before serving time, reforming, and bringing the fight into the political arena instead. Hennessy knows more than he’s letting on but also doesn’t know it all, and while he’s handling pressure from the British government he faces an even bigger challenge from a tired old man grieving the loss of his daughter. 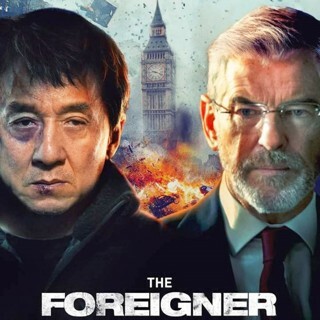 Based on Stephen Leather‘s novel, The Chinaman, The Foreigner packs a hefty amount intrigue, action, and double-crosses into it's nearly two-hour running time. It’s far from a usual Chan film both because he’s only in roughly half of it and because IRA-related plot turns are given equal attention, but the combination works well to deliver intimate thrills and satisfying beats. Writer David Marconi (Enemy of the State) keeps a smart balance between the two halves ensuring neither thread grows stale, and while both are engaging separately things heat up when they collide. It’s maybe far too easy to identify which member of Hennessy’s crew is involved, but that’s far from the point as more layers are stripped away to reveal blame and motivation galore. Brosnan captures his anger as well as his growing frustration at the loss of control to both his own people and Quan’s determination. Chan may still be thought of mostly as a “funny” guy, but he’s played these serious roles before, and he’s played them well. Chan’s strength will always be as a physical entertainer, but he more than acquits himself here as a man who’s lost everything. There’s a tangible pain in his all but defeated face as he lets go of the past and sets his sights solely on revenge. The supporting cast is solid with memorable turns from the likes of Rory Fleck Byrne, Charlie Murphy (no, not that one), and others. The Foreigner doesn’t break the mold, but it never tries to — and doesn’t need to.